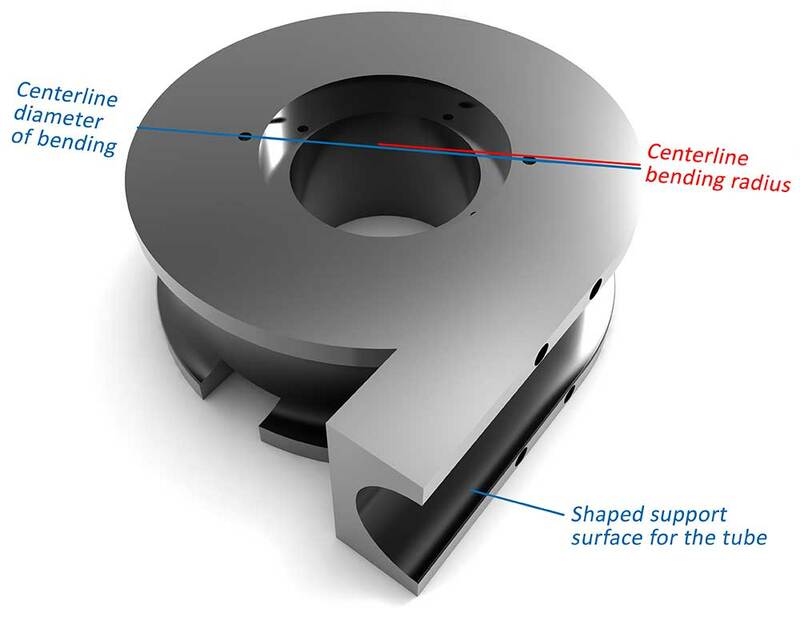 The bend radius is a fundamental parameter for the bend feasibility analysis of a tube: it is essential because it is the value that defines the coefficient which will indicate the degree of difficulty of cold bending. Bending metal tubes is a process that is done using special tube bending machines with particular tools. To give a metal tube a specific bend radius it is necessary to prepare a matrix with a diameter corresponding to that of the tubular element to be bent, and with the desired bend radius. The matrix, produced by our technical office using 3D software, is made from an initial block of hardened steel. Later, it undergoes a tempering treatment to increase its strength and prevent it from being damaged during the tube bending process. 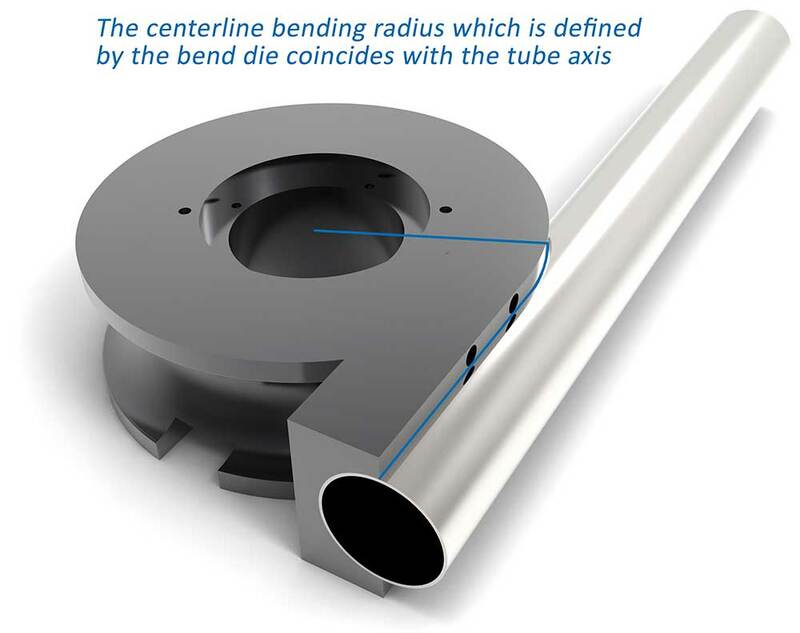 The bend radius is the measurement that the matrix applies to the tubular element to be bent: in the case of round tubes, it always refers to the mean radius, that is, referring to the midline axis passing through the tube, while for square and rectangular tubular elements the reference is to the inner radius, passing through the inner bent portion of the tubular element. In this latter case, however, for the feasibility formulas the reference is always to the mean radius. The bend radius refers to the midline axis of the tube: this is its neutral axis as it passes through its midline. The midline axis provides important information about the feasibility of the bend. It is also the parameter on the basis of which, using a special formula, we calculate the length of the bent tube. 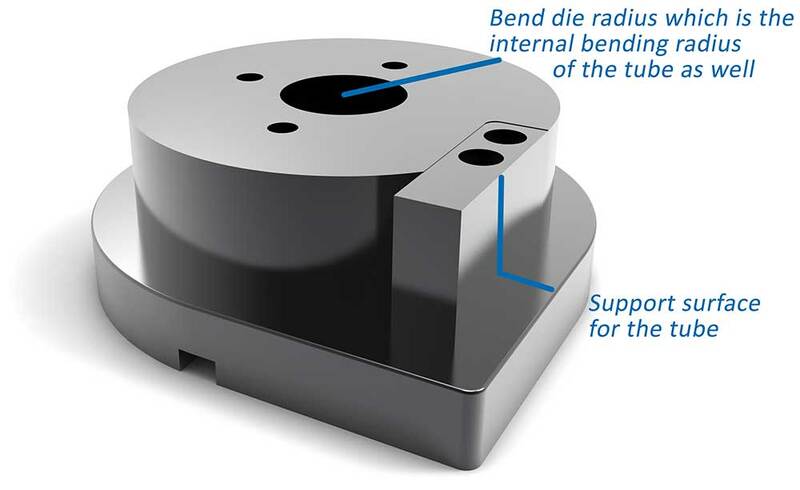 The bend radii possible, referring to a specific tube diameter, will only vary from a minimum of 1.5 to a maximum of 5 times with respect to the tube diameter. These two values are defined as the minimum mean radius and the maximum mean bend radius of the tube. EXAMPLE: For a tube measuring Ø 70mm, the minimum mean bend radius possible is 105 mm while the maximum mean bend radius possible is 350 mm. These values may occasionally change due to the use of particular tooling on the various types of tube bending machines. When round tubes are bent, the reference radius, for the formulas of calculation and also for the information about how to bend it, is the mean bend radius. This because we are referring, theoretically, to the neutral axis of the tube, i.e. an imaginary line that passes through the center of the tube. For square/rectangular tubular elements as well, the feasibility analysis of the tube bend is made considering the mean axis and thus the mean bend radius. When ordering, however, it is important to refer to the inner bend radius. This because the bend matrix for a square/rectangular tube is different from that for round tubes. While in the latter, the radius of the matrix corresponds to the mean radius of the bent tube, in square tubes the radius of the matrix corresponds to the inner radius of the bent tube. The example below is of a matrix for square/rectangular tubular elements. Every bend radius is bound to its matrix, so it makes no difference whether we bend a tube in steel, stainless steel, or aluminum. If we have a tube in steel measuring Ø 70 to bend with an average radius of 105 mm, we will use the same matrix for another tube measuring Ø 70 in aluminum. Every bend radius has its matrix, which is produced on the basis of the diameter of the tube to be processed. 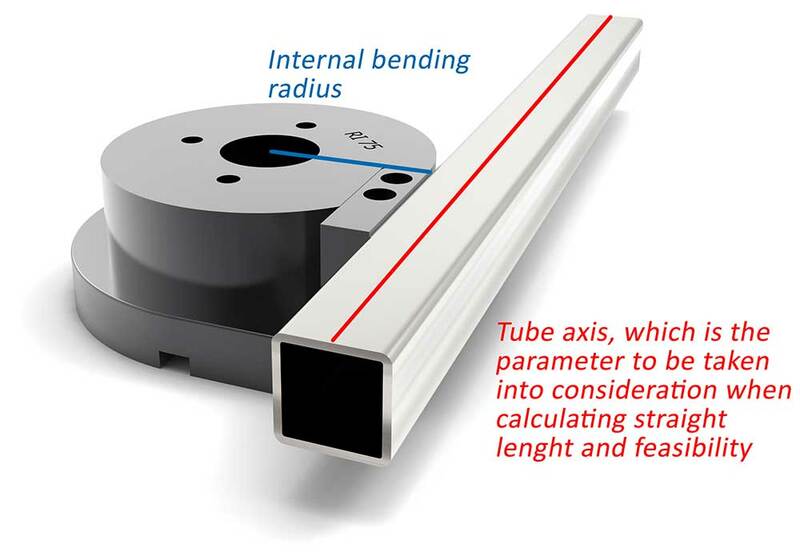 For the mean radius of 50 mm, for example, there will be set of several matrices: one for tubes Ø20, Ø26.9, Ø30 and so on as long as the bend feasibility formulas allow it. On square and rectangular tubular elements there is a bit more flexibility. It is, in fact, possible to bend different tubular elements of different dimensions on the same matrix, depending on the height and thicknesses used to adapt it to the different measurements. Tecnocurve has over 250 matrices for round tubes and about 30 matrices for tubular elements. 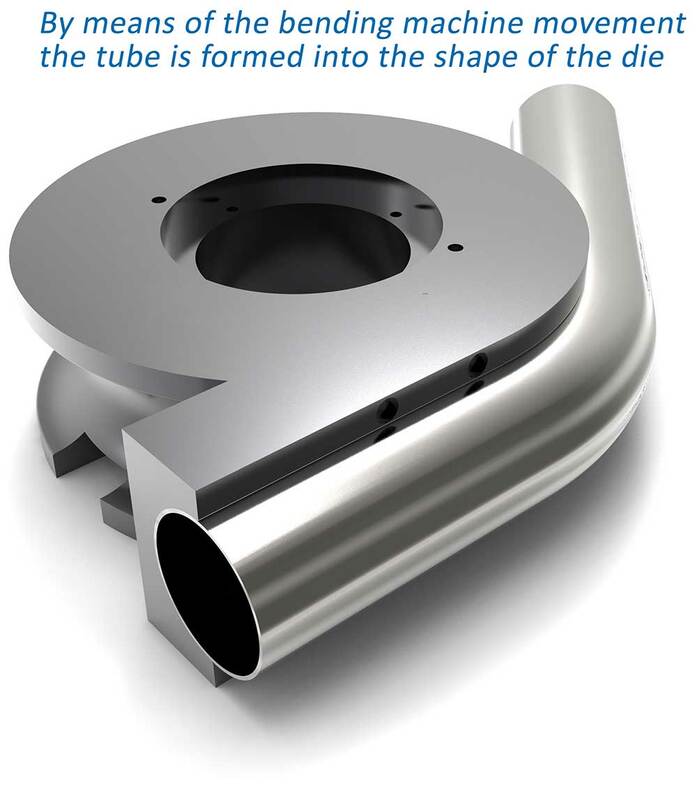 The former are for 250 cross-sections of tube with different bend radii between them while the latter, for the particularity that they can be used for many cross-sections, can satisfy the needs of 500 types of tubular elements. Also when it comes to roll bending tubes, there are formulas for evaluation of the roll bend radius. They are the same as for the bend radius, but the coefficients that we will have to consider are different. This is decisive for the purposes of feasibility of processing. Unlike the bend radius, the roll bend radius is much greater and goes from 5 times the diameter of the tube to infinity. To remain in the same area as the previous example, for a tube Ø70 the minimum roll bend radius will be 350 mm and the maximum will be a theoretically infinite value. 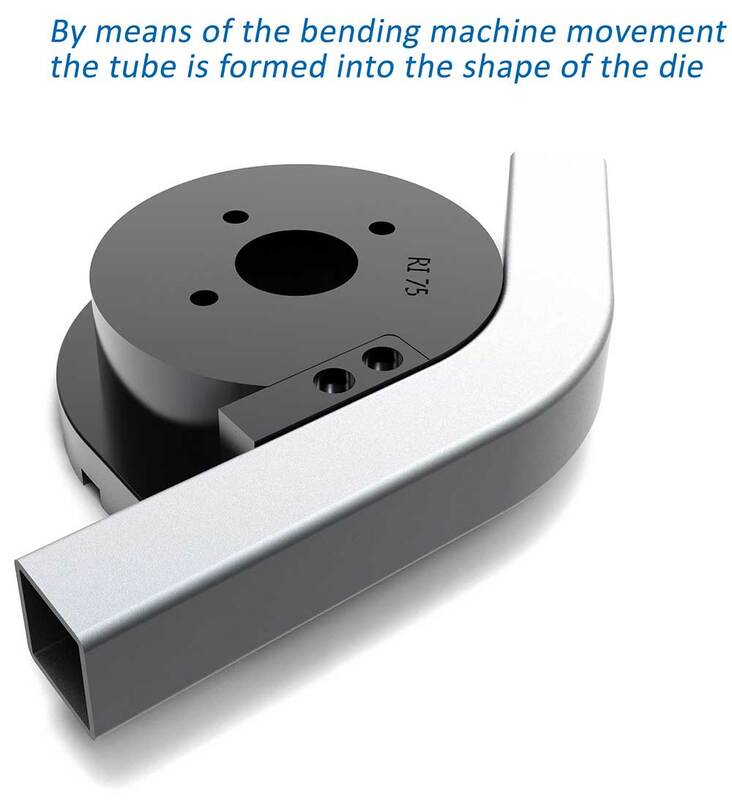 The radius of a roll bent tube is no longer determined, however, by a matrix with fixed measurements, but by a set of three rollers that approach or distance themselves from one another, cold shaping the tube and impressing the desired radius. 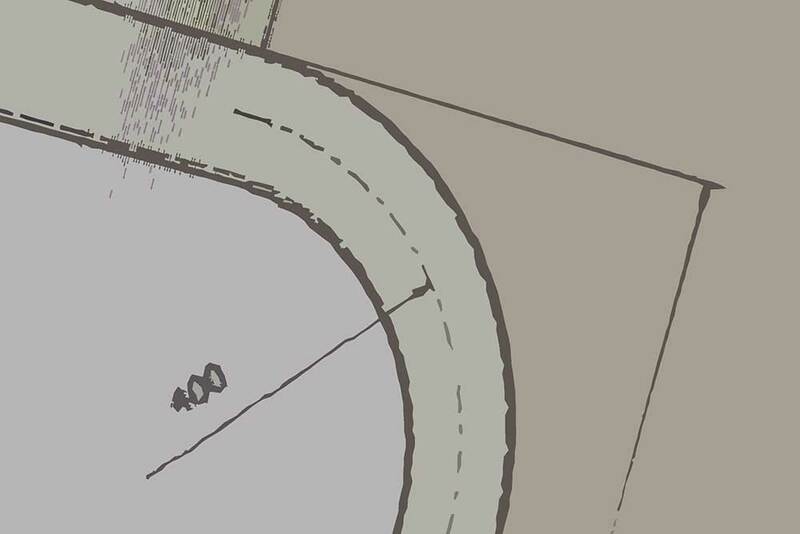 As for bending, we speak of the mean radius in case of round tubes, and of inner radius for tubular elements, but to calculate the feasibility formulas we will always have to refer to the mean radius.